The United States may be the land of the free, but it is also the land of the fat. 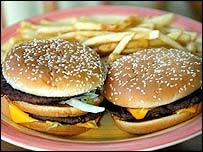 Obesity in the US is linked to 300,000 deaths a year and said to add billions to the country's medical bills. The problem of obesity in schools is described by the US surgeon general as "every bit as threatening to us as is the terrorist threat we face today". Critics say this is a health and economic burden the US cannot sustain - and one that the country has been slow to wake up to. Back in 1960, a 250-pound (113kg) American Football player was considered a giant. This year, more than 550 players weighing 300lbs or more were on NFL training camp rosters. The average US soldier today is more than 22lbs heavier than his World War II counterpart. Military chiefs say an increasing number of potential recruits are just too fat to be eligible. Shelley Hearne, head of the Trust for America's Health (TFAH), says the US has reached "a state of policy paralysis" in regards to obesity. "We have a crisis of poor nutrition and physical inactivity in the US and it's time we dealt with it." "We need more and better data so we can make decisions to get out of the debate limbo in which we are stuck." Some scientists say weight is often wrongly the focus of attention in this debate. But most agree that the unhealthy lifestyles of many in the US need to change. The US is one of the worst affected countries in the world, but in percentage terms not the worst. The United Nations says the global total of overweight individuals rivals, for the first time, the number who are underweight. 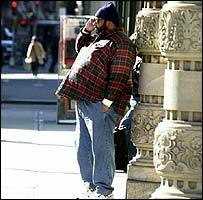 In Iran, Saudi Arabia, Australia - to name but three - adult obesity is increasing alarmingly. On some islands in the South Pacific the svelte are close to extinction. Obesity rates on Nauru and Western Samoa are almost 75%. Yet the US obesity problem has particular resonance, perhaps because it is reflection of the modern way of life the country typifies, with its junk food and technology of convenience. "We have always had a very plentiful supply of cheap food," Morgan Downey, head of the American Obesity Association told the BBC. "And we are fascinated with labour-saving devices like the automobile. These are hallmarks of our society, and of our problem." The other hallmark of American obesity is poverty. 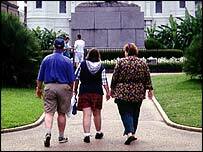 Unlike many developing countries where it is a disease of the newly wealthy, in the US most of the fattest states are in the poor south-east - places like Mississippi, Alabama and Louisiana. Here there are many communities where cheap, unhealthy yet convenient food has become a staple diet, while health education and sports facilities are sorely limited. By contrast, affluent Colorado, home of the Rocky Mountains and the culture of the great outdoors, boasts the country's least heavy citizenry. Professor Kelly Brownell is head of the Rudd Center for Food Policy and Obesity at Yale, a body trying to stimulate government to change America's "toxic environment". He says the problem is the "huge amount of money to be made from a fatter population". "There are some in the Senate and House who are working hard," he told the BBC, "But they are outnumbered by all those in the thrall of the food industry lobby." But the problems are also at the local level. Almost half of all public schools in the US have exclusive contracts with beverage companies, who supply them sugary soft drinks - and a share of the profits. The American Beverage Industry, some of whose members are preparing for an imminent lawsuit on this issue, says soft drink sales in schools are not a major factor in rising childhood obesity rates. For Professor Brownell, this "ticking time bomb" is perhaps the most important area in the fight for change. "We need to focus on the protection of children," he says. "It is difficult to alter the habits of a lifetime, but in prevention we may have the cure."